Recently, I posted an article calling out various cultural appropriators on their practices. One of the examples given in the article was of “Crowned Elegguas” being sold by PlanetVoodoo.com by Denise Alvarado. After writing a blog article blasting me and claiming that SAFE is nothing more than a spiritual police that’s attempting to silence her voice as an artist, I wrote her a reply on her blog. I am cross-posting it here for you all to read, refuting her claims of copyright infringement, and also explaining that her practices are insensitive and offensive to traditional Santeria Lucumí practitioners. First, no one labeled you as a fraud. In fact, your name was not associated with the article until you raised a fuss about the use of a photo from your website (which was used under fair use rights according to copyright law – see below). Once I actually heard from you (instead of second-hand from your friends and your passive-aggressive online posting about me) I removed the image immediately as you requested. Even though I was within my rights to use the image for product reviews and criticism, I opted to take it down and let everyone know who wanted it down and why. To reiterate, you were not labeled as a fraud, you were accused RIGHTLY of cultural appropriation. If you actually read the article and researched the information contained therein, you would see that you are clearly “Taking intellectual property, traditional knowledge, cultural expressions, or artifacts from someone else’s culture without permission … includ(ing) unauthorized use of another culture’s dance, dress, music, language, folklore, cuisine, traditional medicine, religious symbols, etc. It’s most likely to be harmful when the source community is a minority group that has been oppressed or exploited in other ways or when the object of appropriation is particularly sensitive, e.g. sacred objects.” I was referring to your creation of “Eleggua Statues” that wholly appropriate the visual, religious and cultural symbolism of my culture as a Cuban Santero. How do you attain the “permission” to make such objects – through initiation as a priest (Olorisha or Babalawo) in the orisha faith. 1) I belong to the culture, folklore and people from which Eleggua’s worship in the form of a head-like sculpture originates, namely from Cuban Santeria Lucumí. 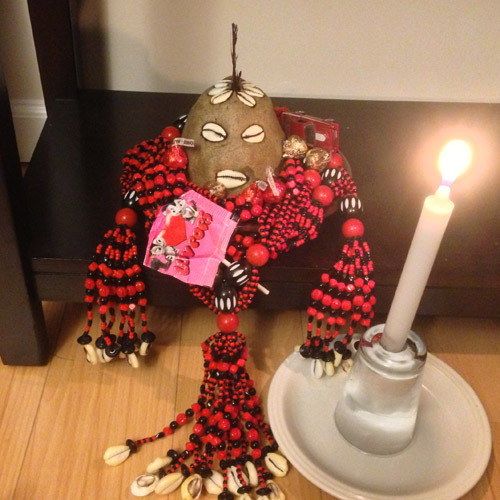 You claim to practice Voodoo/Hoodoo, yet Eleggua is not worshipped in Voodoo nor in Hoodoo. Voodoo works with Legba not Eleggua, and Hoodoo workers are Christians. Legba is not depicted in Voodoo as a clay or cement head, he is more typically depicted as St. Lazarus or in the form of his veve. The construction of an Eleggua that is packed with aches and proper items is not even DONE in Voodoo for which you claim authority. 2) I am an initiated priest in the Santeria Lucumí faith of over 11 years, initiated by a priest who had over 30 years of initiation when he died, and work with Cuban priests who have been raised in the religion since birth. I – by initiation – have authority to speak on these matters. I actually have received Eleggua, gone through kariocha, received igbodú, washed, birthed, and given Eleggua in my life. You do not have that authority. It’s like asking how a Catholic priest has the right to call someone out on things written in the bible… by definition they do. It is their area of expertise. Next you bring up the idea that you are creating sacred art. You claim they are only fetishes. Let’s start with definitions. Mirriam Webster’s dictionary defines a fetish as “an object (as a small stone carving of an animal) believed to have magical power to protect or aid its owner”. You attribute magical powers to your objects. They are not just art. Your product descriptions for said “Crowned Elleguas” states: “Handcrafted from a unique blend of clay and traditional herbs, Ellegua can remove obstacles, improve communication, provide spiritual protection and bring luck and good fortune.” You are making spiritual claims of power for these objects, calling them Ellegua, saying they can remove obstacles, improve communication, provide spiritual protection, etc. You are not presenting this as art, you are ascribing them identity and magical powers. Your own product descriptions are misleading at best. I was utilizing your image for the purpose of “criticism and comment” as well as “teaching and scholarship” to educate the public about what is traditional Santeria Lucumí and what is Culturally Appropriated. Your legal claims of libel hold no ground either as I have not called you a fraud, I have called you a cultural appropriator, and anyone who crafts “artwork” or “spirtual fetishes” as you call them that draw upon the culture of Brazilian Kimbanda/Umbanda and Cuban Lucumí when they have no initiations in said traditions and does not come from those places, is still appropriating cultural elements – in this case, religious symbolism which is a very delicate topic. Not all cultures are the same when it comes to someone outside of their culture making artwork for members of their culture. For example, the Catholic Church has hired Jewish goldsmiths to craft their religious objects and they didn’t really have a problem that the artisans weren’t part of their culture. The same goes with Jewish houses of worship employing non-Jewish experts to craft sculptures or art for their holy places. But not all cultures are amenable to this practice. In particular, African traditional religions including Lucumí, Ifá, Palo Mayombe, Vodou, Candomblé, and Kimbanda just to name a few, are not ok with non-initiated people making objects that emulate their religious or spiritual items. Making objects that draw upon these cultures’ symbols and divinities is insulting to them especially when they had ancestors who died trying to preserve traditional practice through generations. As a culture bearer of two of these religions (Palo and Lucumí) I can certainly tell you that this is highly offensive to those that died preserving our cultural practices. You wouldn’t even know what an Elegguá head looked like had slaves not given their lives to worship in the face of oppressive colonialism. Here’s another good example. As you well know, there are laws in place throughout our country that require you to identify Native-looking artwork as clearly “not made by Native Americans” before they are sold. The state of New Mexico even requires Native artisans and jewelry crafters to stamp their artwork as a sign of authenticity because cultural appropriators came in and started making cheap squash blossom necklaces and fake turquoise jewelry in China then swamping the US markets with these items putting them out of business. You should be particularly sensitive to this as someone who has Native American ancestry, no? How would you feel if someone started making peace pipes and claiming they had the right to create them because “their spirits moved them to do it”? It’s cultural appropriation and it is damaging to minority cultures as my article clearly explained. Now another point you bring up is about why I didn’t contact you personally about this. Frankly it’s because others have brought this up with you before and you didn’t make any changes to your practices. You feel entitled to do this. You claim it is your right as an artist. Indeed this is America and you can do whatever you want, but when someone comes along and calls you out on exactly what you’re doing, you can’t get upset at the end of the day. I’ll also point out that you didn’t contact me personally but instead went through friends and professional associates who were uninvolved in the issue when there was a clearly marked “Contact Us” page on both my church website and my professional conjure site – neither of which you used until my associates pointed them out to you, and only then after you blasted me in a passive-aggressive manner on your blog. My church’s action committee, SAFE, is an educational foundation whose purpose is to educate the public about non-traditional and illegitimate practices. We educate the public, and since the article has gone up I’ve received dozens of emails and messages, as well as in-person thanks from people all congratulating me on finally taking a stand and calling people out on their cultural appropriation. Members of Haitian Vodou, Santeria Lucumi, Brazilian Kimbanda, Palo Mayombe, Traditonal Ifá, Brazilian Umbanda, and practitioners of Hoodoo all have come forward and lauded the article. Only two people have scoffed at it; you being one of them. You call my organization a “spiritual police” and in a sense you are correct. It’s about time that we police our own or point out those who are acting outside of what is spiritually traditional. You have also attempted to sully the name of the association to which I personally belong: The Association of Independent Readers and Rootworkers (AIRR), by throwing their code of conduct in my face and accusing me of breaking their rules regarding copyright infringement. I have already refuted your claim as baseless and cited law to back my stance. As a long-term member of AIRR I have always conducted myself according to the code of conduct and I hold that up as a bastion of ethics and transparency in my work. Where is your code of conduct? I can’t seem to find it on your website, perhaps you could point it out for me? You have the right to spiritually express yourself through art, but if someone is offended by it they will speak out. Freedom of your speech doesn’t mean requirement of my silence in return. My church and it’s SAFE committee also have the right to express ourselves against your “artwork” as non-traditional and examples of cultural appropriation. What’s good for Mama D. is also good for Dr. E.
Finally, I will not only post this in reply on your Tumblr blog and hope you’ll keep it up as a testament to freedom of speech, but I will also copy it on my Santeria Church of the Orishas website and if needed I’ll also include it on my Google+ feed. This dialogue is important as cultural appropriation is damaging to minority cultures. I hope you’ll reconsider the way in which you present these objects on your site and perhaps learn a valuable lesson through this interaction.